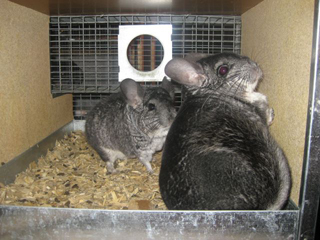 Here you will find information on chinchilla breeding and where to find a chinchilla. There's so much to learn! Many people think this is an easy decision, but they end up regretting it. The babies are cute, but don't count on being able to sell them. Why? Chinchillas are considered an unusual pet, and many people don't want one. They don't see what a great pet they can be when you devote the time to it. Why are chinchillas so hard to sell? Several factors. People are getting better about looking for quality animals - the kind you can't get by pairing just any two chinchillas. Chinchilas are still considered something of an exotic pet, so most people would not consider them for their home anyway. Also, they are something of a luxury with the current economy. If you're planning on making money, forget it. You need a large herd (500+) to even consider breaking even, and you have to be willing to pelt or find an outlet for the animals you can't sell. The expenses of cages, bedding, food, and medication often offset any potential profit for the smaller breeder. Where do you start? If you really want to do it right you need to prepare. You'll need to start with high quality animals that complement each other well. You want to consider temperament (how nice is the chin?) as well. Get some tips on evaluating chinchillas here. When breeding, the most important decision you can make is pairing. Two decent animals can create better quality kits than two show champions! It is vitally important that the chinchillas do not have the same faults. Sometimes it is difficult to introduce chinchillas once you have made a decision on the pair. If you have breeding runs there is a near foolproof strategy! How long until the kits get here? Maybe you need information on mating and pregnancy. During pregnancy you can supplement your chinchillas and provide alfalfa hay to fortify the mother. What do you need in the way of supplies? Just be prepared for problems with the baby - just in case. Here is information on baby chinchillas. We have chinchillas for sale! Breeding for mutations? Genetic information. You might also want to think about breeding runs.